Darkest Minds – First Review! Below is the press announcement for my first published novel, Rise of the Dominator. 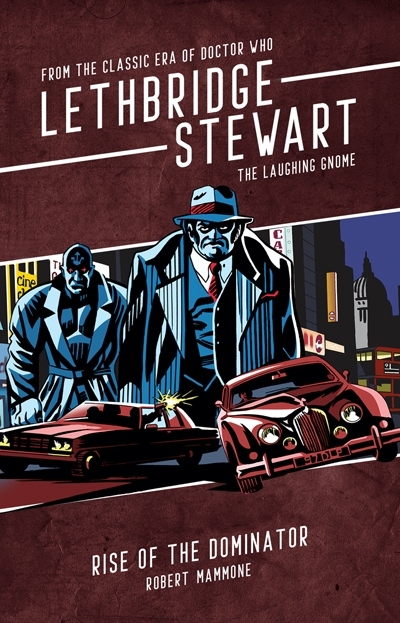 Candy Jar Books is proud to announce book four in its anniversary series of Lethbridge-Stewart novels, The Laughing Gnome: Rise of the Dominator. Following on from The Laughing Gnome: The Danger Men, book four sees the team get back together when they all arrive in 1973 and face off against the Dominator, Director Vaar! Rise of the Dominator sees the return of popular Lethbridge-Stewart author, Robert Mammone, who previously wrote two short stories for the range, and the first of the Travers & Wells novella range. A Spanish safe cracker lands on the English coast and is whisked away to a secret meeting with none other than Vaar. His mission? To liberate a priceless sword forged when Sumer was young, a sword whose unslakeable thirst for life threatens the existence of all humanity. The Laughing Gnome will continue in April and May with books five and six. Lucy Wilson and the Bledoe Cadets by Tim Gambrell, with On His Majesty’s National Service by David A McIntee. NB: IF YOU HAVE A SUBSCRIPTION THE LAUGHING GNOME SERIES IS COVERED BY THIS. THIS BOOK IS ALSO INCLUDED IN THE LAUGHING GNOME SIX-BOOK BUNDLE. The Laughing Gnome: Rise of the Dominator is available for pre-order now for £8.99 (+ p&p). The book is due for release at the end of March. Travers & Wells now on Kindle! My Candy Jar Books novella, Travers & Wells: Other Wars, Other Worlds has recently been re-released on Kindle, after the limited edition hardcover sold out! Just in time for the BBC release of their adaptation of War of the Worlds, Travers & Wells sees Edward Travers (Doctor Who: Web of Fear) and HG Wells (Doctor Who: Timelash) venture into an alternate Britain…where the Martians won! I loved writing it, and the readers love reading it! Don’t take my word for it, check out the reviews at Goodreads! Für mich bisher die beste der Lethbridge-Stewart Novellas und das beste Doctor Who Spin-Off Duo seit Jago und Litefoot. Travers und Wells passen wirklich hervorragend zusammen. Die ganze Geschichte ist sehr gut geschrieben und spannend. Der Cliffhanger am Ende macht gespannt auf die (bestätigte) Fortsetzung. Sehr gut! Um das ganze genießen zu können, sollte man auf jeden Fall Times Squared gelesen und Timelash gesehen haben. For me the best of the Lethbridge-Stewart Novellas and the best Doctor Who spin-off duo since Jago and Litefoot. Travers and Wells are really great together. The whole story is very well written and exciting. The cliffhanger at the end is looking forward to the (confirmed) sequel. Very well! To enjoy the whole thing, be sure to read Times Squared and see Timelash. Not only is Travers & Wells available, but also my grimdark horror fantasy Only the Guilty Live is on Kindle for the pricely sum of barely a cracker! (No, seriosuly, it’s $0.99 everywhere!) Check it out. Grimdark novella ‘Only the Guilty Live’ – published! I’ve been heavily revising my sword and sorcery novella Only the Guilty Live for Kindle publication and it has gone live today! I’ve added a new opening, and heavily revised the body of the story, adding around 3000 words in new text. This is something of an experiment for me, hence the cover, Goya’s Saturn Devouring His Son has been nicked and modified for publication. I’ll be pushing this a little around the usual places and will be interested to see if it gains any traction at all. The Dirty Dozen meets The Exorcist in this exciting chase across a war-ravaged empire! Marduk, the hero of the siege of Skalak’s Pass, is a nearly broken figure. But when his general commands him to lead one final mission deep into enemy territory, he cannot say no. Leading a rag-tag group of misfits, including the demon-possessed corpse of a child, he must overcome his own fears and venture into the besieged capital of the enemy to fulfill his mad Imperator’s demands. Betrayal lurks in every corner, and not everyone gets out alive. Sword and sorcery at its darkest, as blackest magic and highest ideals clash in this exciting novella that will tear at your heart while burying its fangs in your throat! So, if you like your grimdark grim and dark, this is the novella for you. I’d really appreciate it if people tweeted and generally spread the word on social media to give this at least the tiniest bit of traction. Major Spoilers Patreon and more! So, I’ve been away from the blog for a while. I doubt you’ve all been waiting with baited breath for my latest missive – one has to be realistic. I have, however, been busy, beavering away at a new novel for Candy Jar. They’re celebrating the Brigadier with a new series of linked novels, and mine, the third, is called The Day of the Matador. Can’t say more than that, other than the first draft is complete, has been hit over the head with the editing hammer, and is having a lie down for a week or so before I take a butcher’s knife to the structure and give it a good hiding. As a result, I haven’t had a chance to do much in the way of other writing. I did manage to squeeze in a submission to this anthology which was a huge amount of fun to write, and is, how can I say, disgusting! The submission process is ongoing, so we’ll hopefully find out whether it is loved or no soon. The other writing I’ve done has revolved around reviewing comic books for the fantastic Major Spoilers site. Owned/managed/wrangled by the indefatigable Stephen Schleicher, Major Spoilers has been around for just over twelve years and is one of the premiere comic review/discussion/coverage sites out there. Not only that, but Stephen manages a large network of podcasts, dealing in RPG gaming, comic book and pop culture discussion, comic book reviews, comic book creator interviews and heaps more. Major Spoilers relies on community input and funds. Like many other creator owned sites, Major Spoilers has a Patreon running, which covers all the costs of a very large site with an extremely extensive catalogue. I’ve signed up at the $5 level, which gives me access to bonus tracks, behind the scenes pre-show chatter and the satisfaction I’m helping an entrepreneur keep not only his dream alive but give it the chance to grow and expand to cover more news, more reviews and more podcasts! Dare I suggest you show your support by signing up? You can catch all my reviews here and there will be many, many more to come over the coming months. While the Day of the Matador percolates on my hard drive, I’ve been sketching out ideas for some new writing efforts. I hope, more as an experiment than a grand design to rake in tonnes of filthy Amazon lucre, to self-publish a novella in the next month or two. I’m working on the edits and will begin looking into covers etc. Otherwise, there are two other novellas I have in the pipeline, and possibly a collection (maybe self published) of my better short horror fiction efforts from the last few years. We shall see. Travers & Wells – released! In the last few months, I’ve had a 45,000 novella released from UK publisher, Candy Jar. Of course, Candy Jar is well-known for its long running series of Lethbridge-Stewart books, based on the beloved Doctor Who character, Brigadier Alistair Gordon Lethbridge-Stewart. These books use elements, under license, from two 1960s Doctor Who stories, The Abominable Snowmen and The Web of Fear. Characters such as Anne Travers, her father Professor Edward Travers, the Great Intelligence and its robotic servitors, the Yeti all appear throughout the books, which are set in the 60s and 70s. I was approached last year to write a short story, Time and Again, which featured as a bonus extra in the John Peel penned novella, The Life of Evans. Time and Again is effectively a ‘backdoor’ pilot for the range of stories featuring HG Wells (who appeared in Doctor Who’s Timelash, in 1985) and Professor Edward Travers. More in the range are promised. Travers & Wells (sub-titled Other Wars, Other Worlds) uses as its launching pad HG Wells‘ The War of the Worlds and then branches off as Travers and Wells attempt to survive a Britain overrun by the Martian invaders. As you can imagine, I’m very proud of the end result, which came after a lot of blood, sweat and tears. The cover, as you can see below, is fantastic and many thanks are owed to my editor, Andy Frankham-Allen for keeping me on the straight and narrow. If the idea intrigues you, and you like page turning action adventure that never lets up, then I trust Travers & Wells will suit you to the ground. Certainly the guys at the Traveling the Vortex podcast, reviewing the novella in their latest release, absolutely loved it! 400 hardcover copies are available in this limited run, so go here to order yours! Delighted to announce that I have a short story in a newly released anthology called Between the Tracks: Tales from the Ghost Train which is available now. The editor is fellow Australian Steve Dillon, and he’s put together a cracker of a book. The theme is all things to do with trains, and features works from writers such as Ramsey Campbell and M.R. James, which makes me enormously proud (and a little freaked out) to be included with these wonderful authors of the weird and horrific. It’s been about seven years since two of my stories, The Copse and Widdershins, were made available as free audio readings from the horror site, Pseudopod. I liked this one quite a bit. To me, anyway, it’s not really about what happens, because it’s pretty clear from the beginning that our poor protagonists are doomed — if this were a movie, I’d be yelling at the screen for that family to get out of the friggin’ house! — but more about anticipating the slow unreeling of their inevitable doom. As others have pointed out, it’s about atmosphere, and the kind of horror that is based not in shock or gross-out but gradual, mounting dread. I thought the author pulled this off quite well, here. I loved this one. The hints about weird things having happened on previous occasions of the ritual were very effective. The characters were fleshed out just enough to involve you in the events. The idea that a man could unseat reality simply by walking in a certain direction at a certain time was the brilliant part. It felt like a nightmare, and the transition was handled perfectly. Also, the images at the end were horrifically beautiful–surreal and suggestive rather than blatantly monstrous. Click the links on each of the titles in the first paragraph and you’ll be exposed, like a dose of hard radiation, to these two early horror stories from me. I like them and hope you do too! The Havoc Files 3 – released! Get the book my short story Eve of the Fomorians appears in here, from Candy Jar Books. The range editor, Andy Frankham-Allan talks about the book and the contributors in this video. I have a new short story appearing in an upcoming release from Candy Jar Books. A quasi-sequel to the Doctor Who television adventure Timelash, Time and Again will appear as a special bonus in John Peel’s upcoming novella The Life of Evans arriving in March 2017. I had a short story, Eve of the Fomorians, come out over Halloween 2016 and made available to subscribers of the range. Happily, the editor of the Alistair Lethbridge Stewart range Candy Jar, Andy Frankham Allen liked my story and commissioned me to do another one. Time and Again not only revists Karfel, and one of the key rebels who toppled the infamous Borad, but it’s actual remit is to set up a series of novellas, under the umbrella title, Travers & Wells. Here’s the press release. Travers & Wells will be a novella series inspired by the works of HG Wells. It promises to be a very exciting range indeed. Let slip the Dogs of War and pre-order Havoc Files 3! 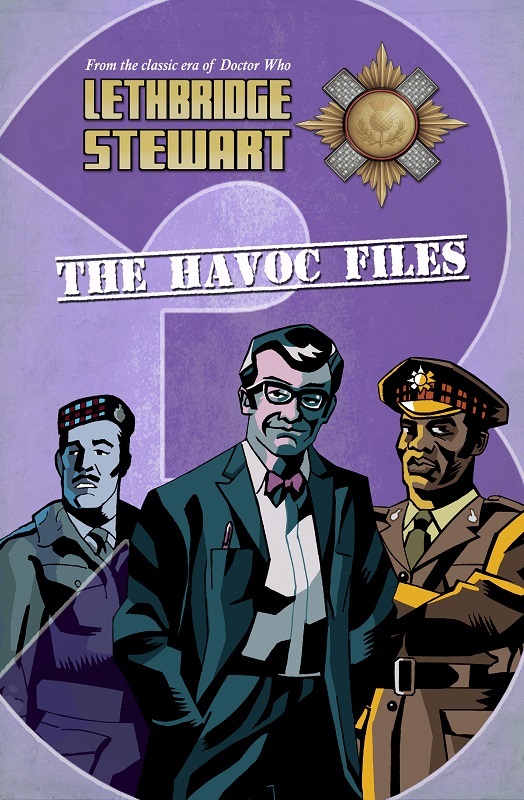 Candy Jar Press, through its Lethbridge Stewart range presents The Havoc Files 3, their latest, limited edition short story collection. It brings together previously published short stories from 2016, plus new material, including my Hallowe’en spookfest, Eve of the Fomorians. Suffer the Children in Amok!